Creating Yoknapatawpha is a study of the crucial interplay of reading and writing processes involved in constructing the textual environment of William Faulkner’s work, and the nature and significance of the world created by these many forces. 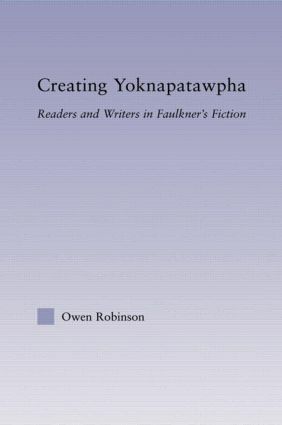 Yoknapatawpha County, the author contends, is the product of these mainly mental processes of construction at all levels, and it is in the similar and even analogous situations that exist between readers and writers of and in the fiction that the dynamic of Faulkner’s work is most keenly discovered. The book discusses novels from throughout Faulkner’s career, and uses elements of Bakhtinian and reader-response theory, among others, to explore its subject, eschewing the limited focus both of strictly formal and more content-oriented approaches, and demonstrating the need for readers and writers to work together, whether harmoniously or otherwise. By examining the fictive nature of Yoknapatawpha, and the requirement for everybody to participate fully in its creation, we can establish useful bases for investigations into the ‘real world’ issues with which Faulkner is so concerned.